Leaders of the BIMSTEC countries pose for a group photo prior to the inauguration of the Second BIMSTEC Summit at the Taj Palace Hotel in New Delhi yesterday. 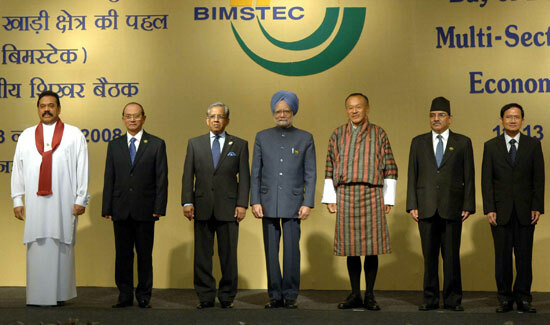 From left: President Mahinda Rajapaksa, Prime Minister of Myanmar General Thein Sein, Bangladesh Chief Advisor Fakhruddin Ahmed, Indian Prime Minister Manmohan Singh, Prime Minister of Bhutan Lyonchhen Jigmi Y. Thinley, Prime Minister of Nepal Pushpa Kamal Dahal ‘Prachanda’ and Prime Minister of Thailand Somchai Wangsawat. Picture by Chandana Perera.